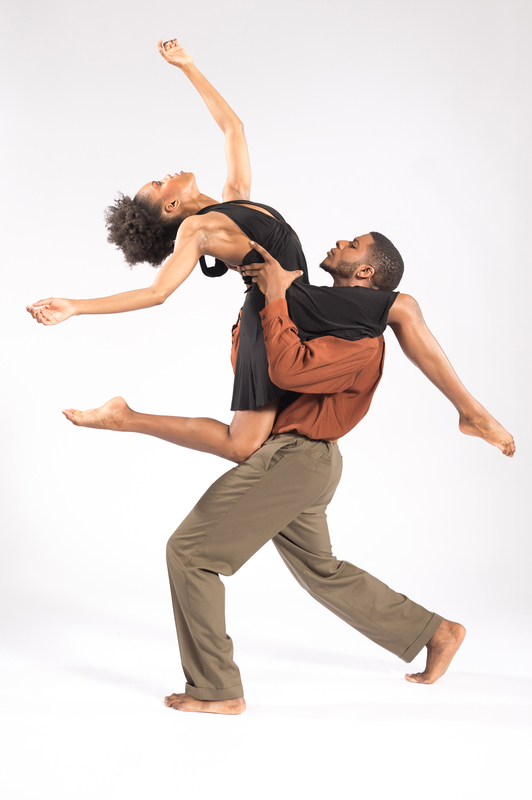 Deeply Rooted Dance Theater is celebrating their 20th Anniversary with a series of concerts entitled Deeply Free (December 8th, 9th and 10th at Chicago’s Reva and David Logan Center for the Arts). The Company was founded in 1995 and first performed in 1996, building year after year into what they are now: a widely traveled (South Africa, Canada, Brazil, France, Germany, Italy, Spain, Switzerland and just absolutely all over the U.S.), and probably even more widely admired Dance Company. Deeply Free features two very different programs: The Friday performance (December 8th at 7:30pm) is an evening length presentation of Fana Tshabalala’s INDUMBA, in which he reimagines his own study of unresolved issues from apartheid politics in his native South Africa, but with a specifically Chicago-based American perspective. The title refers to an African healing hut, and Deeply Rooted describes the evening as one of “stirring resilience and reconciliation”. In their Saturday and Sunday performances (December 9th at 7:30pm and December 10th at 2PM) Deeply Rooted will present works by choreographers Kevin Iega Jeff, Gary Abbott and Nicole Clarke-Springer. But if you want to know what it is about Deeply Rooted that makes for such engaging performances, and what has made for such an impressive artistic journey, you might want to take a close look at what they’re really trying to do, in their own words. “The mission of Deeply Rooted Dance Theater is to re-imagine and diversify the aesthetics of contemporary dance,” they say, but that can’t begin to capture the five dimensional spectrum of imagination that Deeply Rooted continues to bring to their audiences. “Through its uncompromising pursuit of excellence, Deeply Rooted seeks to demonstrate how art and beauty play a transformative role in Chicago, the nation and the world.” When Deeply Rooted talks about art and beauty’s transformative role, their idea of “transformative” is of one, small, careful change at a time, chosen individually with attention to its individual effect. It’s the accumulation of all of that on one stage — their cautiously imagined precision and their throw-caution-to-the-wind commitment — that makes their presentations so insightful, and so impactful. Johnny Nevin: You once said in an interview, “I’ve always believed that great art is born out of community.” As Deeply Rooted Dance Theater completes its first twenty years, how have the many interwoven arts of Deeply Rooted been influenced by community? Kevin Iega Jeff: Deeply Rooted provides a creative process and space for human creativity and reflection. Our performances, dance education programs, managerial engagement and public forums use dance to inspire dialogue, and in “sharing our stories” we discover the richness of commonality and the wealth of difference. This is one prevalent gift of community. Johnny: How would you hope that the communities of Deeply Rooted Dance Theater have been influenced by that art? Iega: I hope that our performances and programs help to inspire a heightened state of consciousness, humanity and compassion, and that each person who is touched by Deeply Rooted stands taller in the world for the greatest good in whatever they do. Johnny: Deeply Free: 20th Anniversary Finale is actually two different concerts — there is the evening length presentation of Fana Tshabalala’s INDUMBA on Friday December 8, and on Saturday and Sunday Deeply Rooted is performing works by Gary Abbott, Nicole Clarke-Springer and yourself. What is it about these particular works, and these choreographers, that represents both Deeply Rooted’s accomplishments and its future? Iega: Nicole’s Femme celebrates the power and beauty of women; we explore human sensuality in Gary’s Desire; and we reflect upon faith, leadership, war, family and healing in Fana’s INDUMBA and my works Church of Nations and Surrender. In A Child’s Eye, which is also my work, is a joyous tribute to youth, community, family and love, and all works speak to our human joys, concerns and conditions. I think our greatest achievement is the community we’ve developed and how that community graciously serves the company’s mission now and into the future. Chicago, IL United States. For ticket information, email tickets@deeplyrootedproductions.org, call 312-795-9777, or visit Deeply Rooted Dance Theater online.